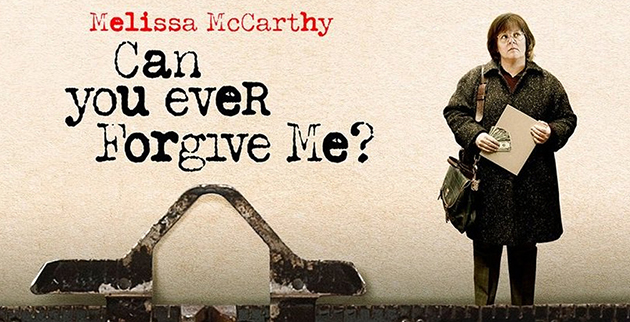 Based on the memoir of the same name, Can You Ever Forgive Me? 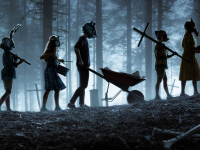 is one of several films, that even with this year having barely started, is in hot contention for a lot of awards. 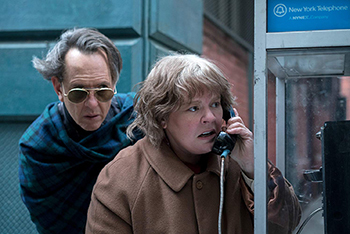 Telling the memoir of Lee Israel, champion forger, author and sometimes journalist, Melissa McCarthy and a familiar appearance from Richard E Grant weave the tale. Stemming from Lee Israel’s confessional autobiography, McCarthy plays the role of Israel as she finds herself failing in business, sinking deeper into alcoholism and becoming more bitter. Although suffering from writer’s block Israel doesn’t find herself short of ideas to try and resolve her financial situation. Having resorted to selling her possessions, including letters from her celebrity clients, she begins forging letters from multiple famous icons to command higher prices for the more scandalous content. When she pushes herself too hard, she ends up partnering up with her friend; former literary colleague and (likely) drug dealer Jack Hock, played by Richard E Grant. 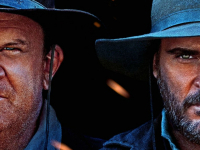 Having previously won acclaim for one slightly mad titular addict in Withnail and I, it’s been a long time since we’ve seen Grant step back into a role like this for quite some time. He plays the slightly dumb, but extremely happy-go-lucky waster with typical aplomb. Somehow, despite this party boy who is well past his prime being the type of person you’d more than likely try to avoid en route to… well, anywhere, or seriously dreading his approach if you were hoping for a quiet drink in the pub – between some excellent direction and the abilities of both Grant and McCarthy, he ends up as the likeable one. This reviewer finds that he usually ends up enjoying most films or shows that feature Melissa McCarthy. She’s versatile at the very least turning a deft hand to roles such as Suki in Gilmore Girls, a saccharine-sweet chef in a quaint town, Meghan in Bridesmaids who…well, just watch the wedding dress scene and even some darker comedy roles in films such as Spy and The Happytime Murders in more recent years. In this latest feature however, she completely transforms herself. In the role of Lee Israel, between herself and the excellent direction from Marielle Heller, she becomes someone truly unlikeable. We follow her regardless, with ravenous curiosity, as we demand to watch people like this far more than loveable roles with few flaws. By setting out to understand Israel, rather than sympathise or denigrate her, Heller has presented us with a picture of a woman in crisis, not only due to the slight edge of ‘crazy cat lady’ with unkempt hair and permanent scowl that McCarthy presents unflinchingly throughout the film, but with her lack of remorse for her actions and comfortable descent into criminality. McCarthy tends to be able to show her character’s flaws well, so even if you’re used to seeing her in her more comedic roles, you may have had an inkling that a part like this was coming, but without knowing when. Her part of Lee Israel is so utterly unrelatable, with her disgusting apartment (replete with cat poo under the bed) and ‘isolated by choice’ personality, you’re forced to watch as though you’re seeing into someone’s life via a two-way mirror. Frankly, on a larger note, it’s refreshing to see a big name like McCarthy moving into the light with an ‘unlikeable woman’ role. Hearkening back to more recent roles such as Mildred Hayes, as played by Frances McDormand, in 3 Billboard Outside Ebbing, Missouri, it may be hard to remember when there WASN’T a role like this in cinema. However, take a moment to think back, even just to the previous decade – as it was certainly a lot rarer to see female characters with this much dimension. This reviewer is extremely glad to see it continuing, and that men aren’t the only ones occupying the anti-hero role. If you’ve not gotten around to seeing it yet, I’d strongly recommend this excellent funny/sad view into the life of the late, far-from-great Lee Israel. It’s funny, raw and deeply moving, making for an excellent film.